It is somewhat paradoxical that a peaceful rural farm can be the same environment where periods of high­intensity noise may result in hearing loss among agricultural workers. Based on statistics for hearing loss in the general public, it is estimated that several hundred thousand farmers have diagnosed or undiagnosed hearing impairment. According to the National Safety Council, noise ranks as the number one cause of hearing loss, followed by injury and disease. Research documents that farm noise exposure is a major cause of noise-induced hearing loss. Sources of noise on the farm include: Machinery, small engines and power tools. Both large machinery (like combines and tractors) and small engines (like lawn mowers and chain saws) can damage hearing with prolonged, repeated exposure. Research conducted at the National Farm Medicine Center in Wisconsin, shows that hearing loss on the farm begins early. Studies show that almost 70 percent of teenagers who live and/or work on a farm show signs of early noise-induced hearing loss. 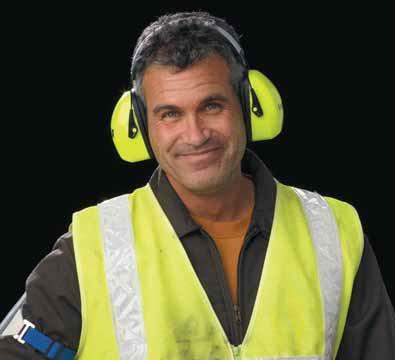 Impaired hearing can present hazards in a busy work place such as a farm. An abundance of technology is available to assist communication for persons with hearing loss. Examples of personal, group, and telephone communication are presented below. Technology that assists daily activities is mentioned as well. Farmers who have a hearing impairment need more than technology to accommodate their loss of hearing. They also need to develop accommodating work strategies for the farm. signals for safe, efficient, unambiguous communication. The American Society of Agricultural Engineers developed a set of agricultural hand signals to be used around high sound level farm equipment that should be suitable for use by most farmers with hearing impairments. Simulate cranking of vehicles by moving arm in circular motion at waist level. Draw either hand, palm down across the neck in a "throat-cutting" motion. Make circular motion with either hand pointing to the ground. Make circular motion with either hand at head level. Place palms at ear level, facing head, and move laterally inward to indicate remaining distance to go. Point toward person(s), vehicle(s), unit(s); beckon by holding the arm horizontally to the front, palm up, and motioning toward the body. Face the desired direction of movement; hold the arm extended to the rear; then swing it overhead and forward in the direction of desired movement until it is horizontal palm down. Raise the hand upward to the full extent of the arm, palm to the front. Hold that position until the signal is understood. Raise the hand to the shoulder, fist closed; thrust the fist upward to the full extent of the arm and back to the shoulder rapidly several times. Extend the arm horizontally sideward, palm down, and wave arm downward 45 degrees minimum several times, keeping the arm straight. Do not move arm above horizontal. Wherever audible alarms are used on the farm, visual alarms should be installed as well. This will warn an operator who may not hear the alarm. Farmers who wear hearing aids may find communication difficult inside farm buildings constructed with metal roofs and siding. Metal surfaces tend to reflect background noises that are then amplified by the hearing aid, making the noise more likely to “cover up” any intended message. Adding sound absorbing materials to the inside surfaces of metal buildings may reduce the amount of background noise amplified by the hearing aid and result in clearer communication while inside those buildings. Fibrous and porous materials such as mineral fibers, glass fibers, and open cell foams have good sound absorbing qualities. Farms often have a great deal of vehicle traffic from automobiles, tractors, and other equipment being moved from one point to the next. For safety sake, a farmer with a hearing loss must learn to always look before crossing any road or vehicle path on the farm. The most common form of technology used to accommodate a hearing impairment is the hearing aid. It is a miniature amplifier, microphone and speaker that is placed into the ear to make sounds louder. As with most technology, options are available. Before purchasing a hearing aid, consult with a hearing specialist or a doctor. Hearing aid sales offices can also test your hearing. Seek recommendations from a certified audiologist or otorhinolaryngologist. Neck loops worn around the neck for use with a hearing aid T-coil. The neck loop has a plug that can connect to the output jack of a personal reviver, a television set, a radio, or other audio instrument. Alarm clocks flash a strobe light or vibrate the pillow or bed to signal that it’s time to wake up. Phone call signalers alert you to an incoming call by flashing a lamp on and off. Smoke and fire detectors are available that flash a strobe light when activated. Portable computers can serve as a communication aid by typing messages on the screen. handsets have adjustable volume and directly replace the old phone handset. Some telephones are available with built-in amplifiers that increase volume 15 to 20dB. instant message systems on the computer are another effective method of communication. There are also methods for coping with hearing loss that do not involve technology. These include speech reading, sign language, use of interpreters, hearing dogs, and even paper and pencil.